Earn up to 1000 LaPoints. La Gift Vouchers can be issued in any denomination from £5 to £1,000 and are all printed on recycled paper, card and delivered in recycled envelopes along with a complimentary pair of earrings if you purchase £50 or more. We can deliver straight to your desired address and even write a message in a card for you! 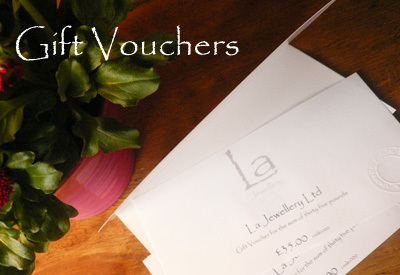 La Gift Vouchers can be used as part payment or full payment for jewellery and is a great way of saving for a little something special that you have your sites on! Ideal as a gift for a friend or relative or as a company bonus.